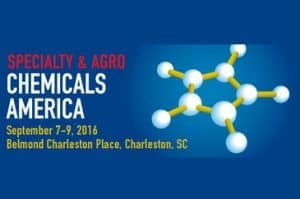 Chemicals America, the organization responsible for creating the annual Specialty and Agro Chemicals trade show and conference, expects a record attendance for their 2016 event, to be held September 7–9 at the Belmond Charleston Place in Charleston, South Carolina. The main exhibitor booths have sold out for the North American show, focused on the chemical products and technologies that have specific applications for the agrochemical and specialty chemical manufacturing markets. ChemDesign, a sponsor and exhibitor, will be hosting meetings throughout the event, as well as meeting attendees at their booth (#800). Click here for this full conference schedule. ChemDesign will provide industry updates from their twitter feed, @chem_design, during the expo. This entry was posted in News and tagged American Chemistry Council, ChemDesign, Chemicals America. Bookmark the permalink.